I deleted the CSS code in this post and attached a ZIP with CSS files in the other post reply. Have a nice day! 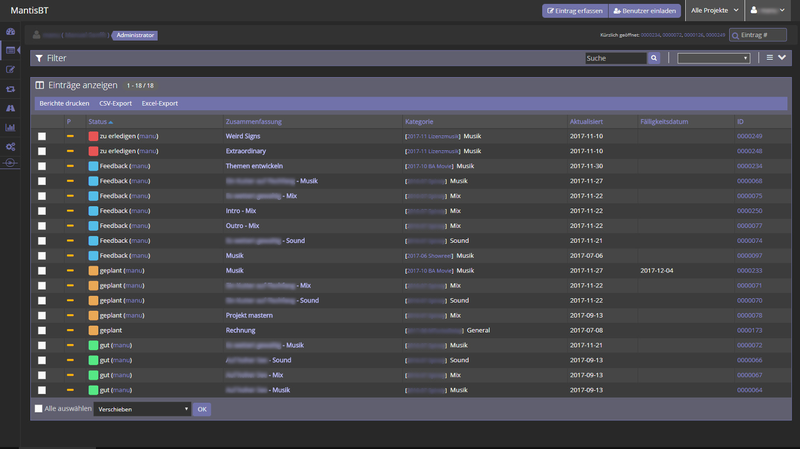 And ask: are there any skins / themes for MantisBT 2.5.1 out there? Or are there any possibilities to skin it in an easy way instead of Chrome + "Ctrl+Shift+C" + hovering over the elements to get the class name + overwriting that class ?? FYI: I already searched this forum many times and the web but I could only find some kind of themes for MantisBT 1.3 or so. I appreciate every help! Last edited by Tagirijus on Dec 30, 2017 6:17 pm, edited 2 times in total. Ok, I managed to tweak the existing css files a bit and added my own improved default.css - I attached all files for those who are also seeking for a dark theme of mantis bug tracker. I am no professional webdesigner! Oh and of course: backup the original files !!! Did you consider to write a plugin ? Using JQuery and custom CSS stylesheet for example ? Currently working on a wiki-based plugin for MantisBT 2.X. If you'd like to test it, contact me or see the plugin section. No, I did not even know that you could achieve this theming with plugins. MOreover I unfortunately would totally not know how to do this at the moment. Thus I had to spend more time here, while I already achieved my goal for me at least. Maybe I'll check the thing with plugins later, thanks for the idea. In fact, I'm thinking about writing a little UI theme plugin. So, if you ever get time to achieve this, your help might be welcome. Let me know if you go further in the development of such a UI theme. I'll probably update this thread then, of course! is there a screenshot of the dark theme? Everything works just great, but the plugin won't load on every page. E.G. If I use the search bar, the result page doesn't load the theme. It's not the only page that doesn't load the theme though. Any workaround, alternative or fix? Actually, I think it might happen because not all the Events are called on every pages. I did not look into this and at the moment I do not have the time for this unfortunately, sorry. Pull request are weclcome though, if somebody else might want to look into this. Hey, thanks for the reply, I tried to simply swap those two but it basically made it worse, should look more into the documentation you provided. I skipped working on it since I posted the error and I'm on vacation for the next 2 weeks, but I'm still trying to fix it. Any idea is welcome.